Foundry Gridnik was developed from the single weight monospaced typeface, originated by Dutch designer Wim Crouwel, for typewriter use in the 1960s, but it was never released. A modiﬁed version of it can still be seen today on Crouwel’s 1976 designs for the low-value postage stamps of the ppt, Dutch post ofﬁce, which feature the stamp value only, displaying the numerals to full effect. 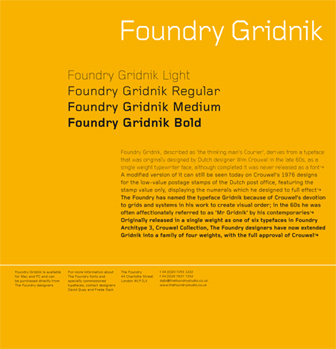 Foundry Gridnik’s geometric. Crouwel was affectionately known as ‘Mr Gridnik’ by his contemporaries because of his devotion to grids and systems. This inspired the name Foundry Gridnik for the typeface family. Although based on logic, rationality and with a strict adherence to the grid, it also has a human dimension that sets it apart. To quote Crouwel, ‘I am a functionalist troubled by aesthetics’. Foundry Gridnik was developed from the single weight monospaced typeface, originated by Dutch designer Wim Crouwel, for typewriter use in the 1960s, but it was never released. A modiﬁed version of it can still be seen today on Crouwel’s 1976 designs for the low-value postage stamps of the ppt, Dutch post ofﬁce, which feature the stamp value only, displaying the numerals to full effect. Foundry Gridnik’s geometric,. Crouwel was affectionately known as ‘Mr Gridnik’ by his contemporaries because of his devotion to grids and systems. This inspired the name Foundry Gridnik for the typeface family. Although based on logic, rationality and with a strict adherence to the grid, it also has a human dimension that sets it apart. To quote Crouwel, ‘I am a functionalist troubled by aesthetics’. Foundry Gridnik was originally released in a single weight font as one of six typefaces in Foundry Architype 3, the Crouwel Collection, Foundry Gridnik has now been extended by The Foundry designers into a family of four weights, with the full approval of Crouwel. Broos: The Gridnik goes back to the typeface that you once designed for a typewriter. Crouwel: It was a typewriter with varying letter widths, like the IBM golfball, which also had different widths. With the more modern, electric typewriters at the time, you were already able to make variations of six or seven weights for a letter. Compared to a normal typeface, that was of course not much, but it was already far more advanced than the single width of the old-fashioned typewriter. It was commissioned by Olivetti. Josef Müller-Brockmann was also commissioned to make new fonts for that new electric typewriter. It is in the book, ‘Design Proces Olivetti: 1908–1978’: ‘Typeface design Wim Crouwel, Perry A King with S Miranda, Herbert Lindinger and Josef Müller-Brockmann’ and apparently Arturo Rolfo as well. They all designed a typeface. Type bars, the ‘golf ball’ and the ‘daisy wheel’ were the systems that you had then. In any case, it never happened. What the reason was, I don’t know, but I believe that typewriter was a model that never went into production, because the computer took over. Broos: The letter was called ‘Polytene’. Crouwel: That is what Olivetti called it. Broos: You more or less used it for the numerals on the postage stamps first released in 1976. Crouwel: That was about the same time. I was busy with the Olivetti letter and made a variation for the stamps. Now I don’t know for sure which was first, the stamp or the typewriter font. Broos: So the Gridnik is the last in a series of three, the Olivetti letter, the postage stamp numerals and then the Gridnik. Crouwel: I was asked to make the Gridnik, although it was not called that then. It happened as a result of the typewriter font for Olivetti. I still had the drawings in large format. David Quay of The Foundry in London asked if they could put them into production. They made all those additional characters. For Olivetti, only a small portion of them had been made, and they certainly had nowhere near the number of characters that have to be in a computer today. The whole thing, with a few correction stages, was completed in collaboration with them. The Foundry digitized Gridnik from the original pen and ink drawings that Crouwel’s father had made. They were artworked with amazing precision. All those tiny rounded corners were perfect, this made digitizing far easier. It was digitized in Ikarus, a pre-Mac programme developed in Germany by URW, which I still think is far more accurate than more recent font software, and allows for finer tuning. The Gridnik family was originally developed out of a single weight. Designers who had used it from the Architype 3 Crouwel collection, where it was first released, kept asking if we could add some more weights. We knew we had a potentially very commercial and successful font family in the making, so with Crouwel’s blessing we did it. In the original idea that Crouwel had developed for Olivetti he used a basic unit of 7. Using multiples of this he arrived at a stem width of 56. From this it was easy to calculate the other 3 new weights we added, halving it for the light to a stem width of 28, adding half again to the 56 to make a stem width of 84 for the medium, and lastly doubling the 56 to make 112 for the bold. This was entirely in keeping with Crouwel’s thinking. We designed extra characters to make a full character set, like the Euro symbol which of course didn’t exist in the 1960s. The only original character that we modified was the lowercase ‘r’ which had to be fractionally reduced in width to make it space well in small text. Some years ago after Gridnik was published I asked Wim Crouwel what was inspiration behind his ‘Polytene’. He told me that it was lettering from the sides of naval ships.